July 18, 2011 9: 30 pm, at the No. 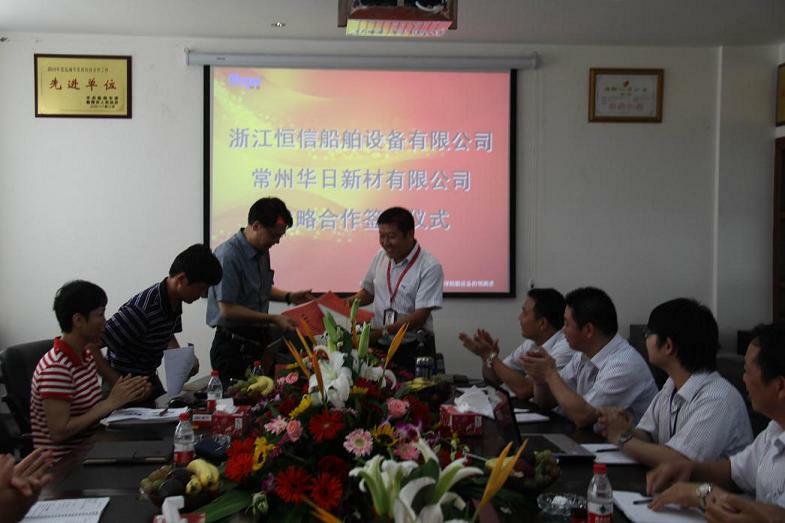 I Conference Room, our company and Changzhou Huari New Material Co., Ltd. held a strategic partnership and signing ceremony. Our Chairman and Managing Director Mr. Jiang Guangyao, Changzhou Huari New Material, General Manager Mr. Mao Jianwei , both attend the signing ceremony. After the ceremony, Managing Director Mr. Jiang Guangyao, Changzhou Huari New Material, General Manager Mr. Mao Jianwei, gave a warm speech, Mr. Jiang in his speech that affirmed Changzhou Huari New Material Co., Ltd. management model and asked our participants to actively learn; mr.Mao always expressed our confidence in the development, must grasp the opportunity to increase bilateral cooperation efforts. Upon this opportunity, Both two sides also shared each other's business management experience.